When Mark Dworkin sat in the projectionist’s booth of The Clyde Theatre in the 1970s making sure the images on the screen kept moving, he didn’t know his own movies would one day be projected on that screen. He knew only that he enjoyed filming amateur theatricals and local events all over Whidbey Island. When carpenter Melissa Young traveled to Central America to build schools in the 1980s, she couldn’t foresee that her excellent Spanish and rapport with villagers would lead her to help edit a short film about the effect of the war on the peoples of Nicaragua. In fact, as she was leading the building brigade, she considered the film—shot on location—a distraction from the real work of reconstruction. But when they found each other in the course of making that film, Dworkin and Young each found a life path, one dedicated to telling the stories of ordinary people—determined and sometimes visionary—living extraordinary lives. They also found the perfect name to describe their new venture. “When I saw the power of witnessing, the power of storytelling, the power of film, I traded my woodworking tools for a camera,” commented Young. If their films—many award-winning—follow a similar trajectory, it is to identify a conflict, problem or injustice and present individuals resisting the status quo, finding alternatives, struggling to remake the world. You might say that Young and Dworkin put a human face on the dynamics of change—individual as well as institutional. Although every one of their 22 films made since 1986 explores how change happens, the who, what, and why is unique in each case. Among their subjects: The plight of post-industrial Detroit (“We are not Ghosts,” 2012). Threats posed by farmed salmon (“Net Loss,” 2003). The impacts of genetic engineering on agriculture (“Risky Business,” 1996). The lives of 19th-century women in Central Washington and British Columbia (How Can I Keep on Singing?” 2001). Their latest film, “Shift Change,” examines employee-owned workplaces inside and outside the U.S.
“Shift Change” has screened in hundreds of festivals, theatres, universities and community settings in the U.S., Canada, Spain, Austria, Australia and Taiwan. More than 25,000 people have watched the preview online. The filmmakers have appeared on several national talk shows. “The response to ‘Shift Change’ has been greater than any of our previous films,” commented Young. “We’ve been contacted by university business schools, community groups, new economists, organized labor, entrepreneurs.” Dworkin attributes the response to widespread concern over the scarcity of jobs, increasing inequality and corporate control. The filmmakers choose their subjects carefully before investing the several years needed from conception to finished product. Research and preparation is usually followed by travel to selected locations and interviews with selected individuals. All along the way, the team invites collaboration and solicits advice to help them understand the realities and nuances of their chosen subject. 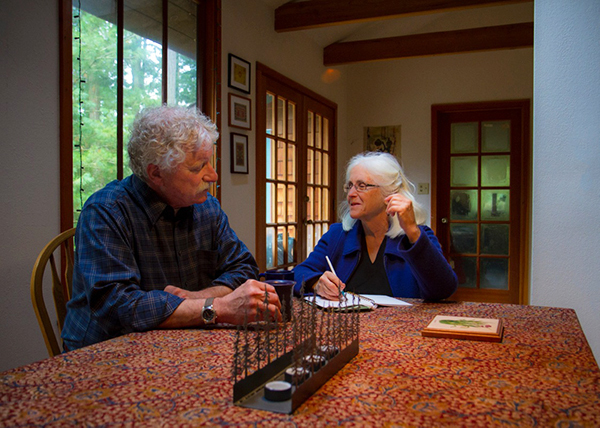 To keep overhead costs down, Young and Dworkin return to their Whidbey Island home to edit the film. Those 70 people, and many more besides, were thrilled to be occupying the seats of The Clyde in late December, 2012 when “Shift Change” made its local debut. During a subsequent conversation with the audience, the filmmakers expressed their deep gratitude for the faith and support of their friends and neighbors. The response to the film and the filmmakers was the kind you’d expect from an audience that had watched their duo of documentarians “bring it on home”—time after time, film after film. It was the kind of response you’d expect from folks who had witnessed two ordinary people doing extraordinary things: Mark Dworkin, part-time projectionist, community archivist, filmmaker (most Sundays you can still find him in the projection booth at The Clyde) and Melissa Young, carpenter, filmmaker, and builder of new structures to house our hopes and dreams. Dianna MacLeod holds a degree in journalism from the University of Michigan. She moved to Whidbey Island in 2011 to complete a novel. I’m looking forward to seeing Shift Change on PBS. Thank you Melissa and Mark for bringing stories, heart and hope to audiences. We really do need a better way of doing things. I’m a fan of worker owned co-operatives. It’s an important conversation! Thank you so much for all your work. I hope to see some of your other work.